Students from Kings High School have been selected to paint a rain barrel as part of the seventh annual Rain Barrel Art Project at the Cincinnati Zoo. Kaleigh Cooke, Tiffany Alcorn, Michelle Jiang, and Ainslee Anderson-Clark created their barrel entitled, Written in the Stars. The idea of the design came from Kaleigh Cooke, daughter of KHS Art Teacher, Carrie Cooke. Kaleigh said, "Ever since I was little, I have been fascinated with the stars and how light has the power to portray colors, shapes, and travel millions of miles. When it came time for the barrel design we wanted to stay true to the natural beauty of the sky but celebrate the amazing variety of animals here on Earth." The team created the glow-in-the-dark barrel designed by Kaleigh, illustrated by Michelle, drawn by Tiffany and Michelle, and the whole team painted the barrel. The Rain Barrel Art Project is a joint effort of SaveLocalWaters.org and the Cincinnati Zoo & Botanical Garden with a desire to educate people on environmental issues like stormwater runoff, watersheds, and water conservation. 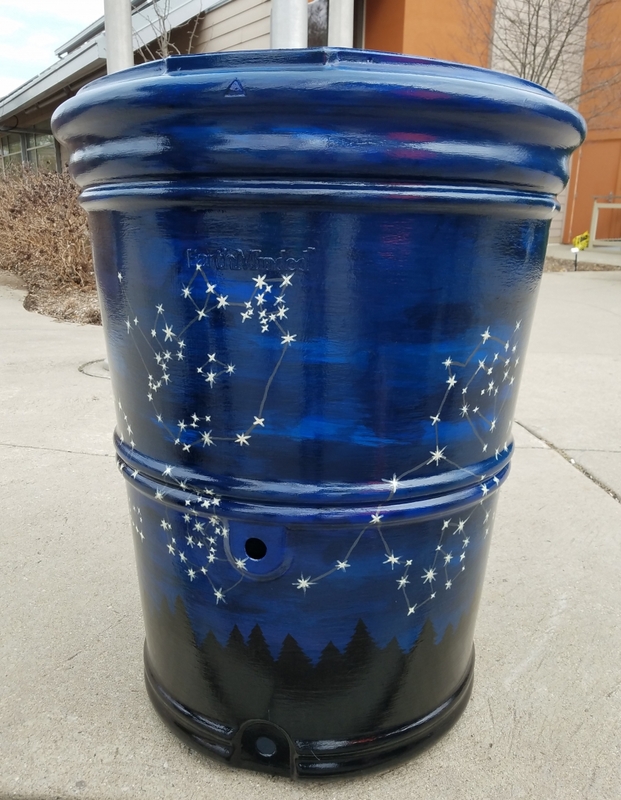 As part of this initiative, students and other community members throughout the Ohio River Valley submitted artistic designs to beautify otherwise dull rain barrels. About 40 of those designs were selected, and the submitting artists’ barrels will be displayed at the Cincinnati Zoo’s Party for the Planet between April 15-25, 2019 and will be auctioned during a reception on April 25. Digital bids will be accepted using a mobile phone app or by using computer stations that will be set up at the event. If you visit the zoo during the viewing period, make sure you look for our KHS Students' barrel!